Postal Service Moves To Halt Saturday Mail : The Two-Way The decision has been long anticipated. The Postal Service continues to lose billions of dollars a year and is looking for ways to cut costs. Eliminating Saturday delivery of first-class mail (but not packages) might save it about $2 billion annually. 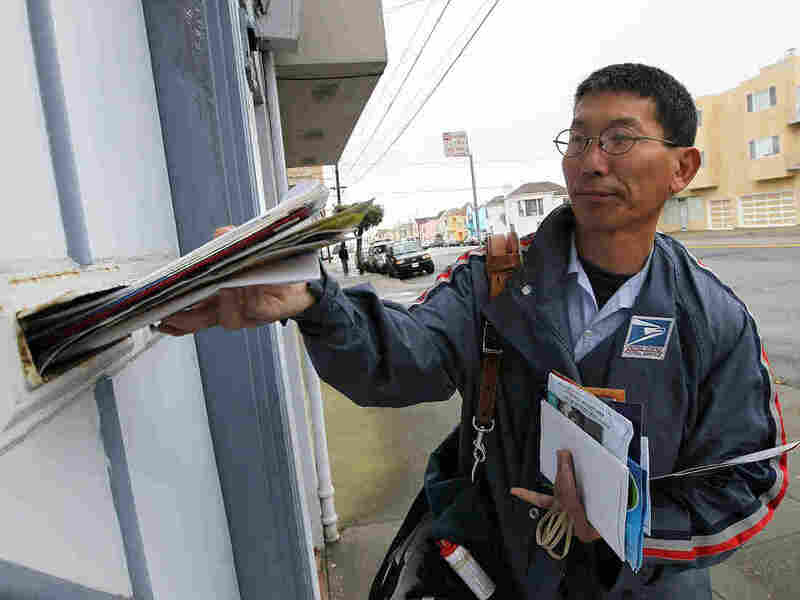 Letter carrier Raymond Hou delivering mail on his route in San Francisco (March 2010 file photo). Calling it "absolutely necessary" if the U.S. Postal Service is going to stop losing billions of dollars a year and reach anything close to financial stability, Postmaster Gen. Patrick Donahoe confirmed Wednesday morning that USPS is moving to eliminate Saturday delivery of first-class mail. "Beginning the week of Aug. 5 this year," Donahoe said, USPS will provide "six days of package delivery and five days of mail delivery. ... We will not deliver or collect mail on Saturdays." Its decision could, however, run into challenges from Congress and from unions that represent the Postal Service's employees. Donahoe made the case, though, that USPS has no choice. The Postal Service, which lost nearly $16 billion last year, will save about $2 billion a year with this change, Donahoe said. Eliminating Saturday mail delivery, said Donahoe, is "just one part of a much larger strategy to return the Postal Service to long-term financial security." That strategy has included the closing of many facilities. As for whether it's legal for the Postal Service to do this without an OK from Congress, Donahoe said "it is our opinion that the way the law is set right now ... that we can make this change." The Postal Service's current "continuing resolution ... does not bind us" to a six-day delivery schedule, Donahoe said. Questioned further about the legality of the decision and how members of Congress may react, Donahoe said that "part of my job is to make a very clear and concise argument in front of Congress and in front of the administration that what we're doing is the right thing." Would you miss Saturday mail delivery if it was discontinued? What if Congress moves to block the elimination of Saturday service? Donahoe did not comment on how USPS might react to that, other than to say USPS hopes to work with lawmakers on its plans. With only three short interruptions, the Post Office has been delivering mail six days a week since 1863. We'll be updating this post with more news from his announcement. The decision to end Saturday delivery drew criticism from the National Association of Letter Carriers and the greeting card industry. The letter carriers' union pilloried Donahoe, saying he is flouting the law and should step down rather than forge ahead. In a statement, union President Fredric Rolando called the plan "a disastrous idea that would have a profoundly negative effect on the Postal Service and on millions of customers." Businesses who've lobbied to keep Saturday delivery said they were rounding up their troops to see whether Congress might intervene, NPR's Yuki Noguchi reports on All Things Considered. George White, president of Up With Paper and chairman of the Greeting Card Association's postal affairs committee, said curtailing deliveries will only accelerate the Postal Service's demise. "Greeting cards are really the reason that people go to their mailbox every day," he said. "Because what they're hoping to get in all their mail is to get some level of personal correspondence." The U.S. Postal Service, which has been preparing the public for this news for a couple years now, will announce this morning that it plans to halt Saturday delivery of first-class mail this summer, according to reports from The Associated Press and CBS News. "The plan to shrink delivery from six days a week to five would only affect first-class mail, while packages, mail-order medicines, priority and express mail would still get delivered on Saturdays." It's still not clear, though, how the Postal Service will do this if Congress doesn't say it's OK. According to CBS, "lawyers for the Postal Service think that they have figured out a way around [that]."